The morning weather was still bad but the news we received was good. Our five member team in Ponjothang has managed to get 15 horses. It was then I wondered how they must have spent their night in that muddy stretch of road. They later told us that they managed to slip into a tent-hostel prepared for the racers who would be spending their first night there. O' talking about the race, four members from our team had stayed back in Gasa to take part in the Snowman Run. Unlike us they would be beginning the journey from Gasa Tshachu and run the entire stretch of muddy road we had covered in truck. While I had always feared if I would be able to trek to Laya these were the people who decided to run to Laya. God. Later in Laya we would learn that the winners had cover the entire distance in little more than four hours, which I took nearly sixteen hours. How did they do that? From Koina it was a steep ascend but the track was fairly good compared to the stretch below Ponjothang where even the horses sunk half their body in sludge. Trekking wasn’t as social as I imagined, we couldn’t walk in group and chat; each had to maintain their own pace and it was a lonely affair. My heartbeat was the loudest sound I could as I inched my way up the hill, often thinking if I should wait a while for the person behind me. Then the internal dialogue began, I was in conversation with myself. Reviewing my life and debating over issues, big and small. Settling matters I had at hand, negotiating with myself and forgiving people, feeling grateful and even composing songs. Ok so that was the reason people go on trekking, to catch up with their inner selves. When the board meeting within me had started I was lighter on my feet. I frequently had to take breaks from my inner meeting to greet young Layaps descending down to Gasa to take part in the Snowman Run. Looking at the way their feet were negotiating with the mountain trail I knew this race was theirs. 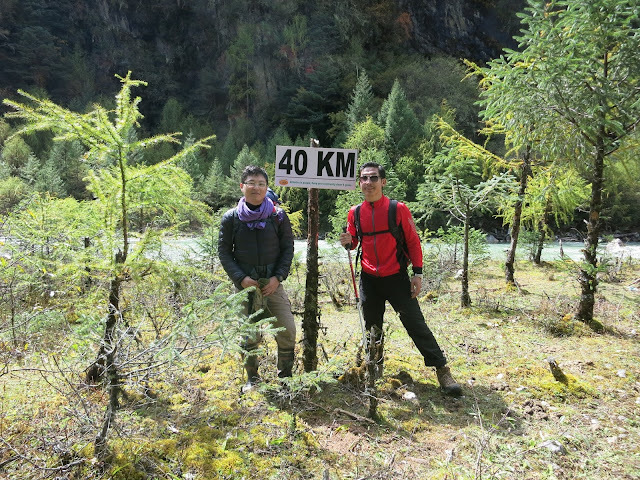 Upon reaching the final curve, from where I could see the Mo-Chhu river down below, the path gradually descended along the hillside. The view from that point was spectacular on the north and the south, stretching endlessly. Across the river it was all gigantic mountains shaped and colored so differently from anything I had seen before. The path was almost running parallel with the river, which could not be heard yet. Gradually I could hear the river, and then the path ran alongside it. After recurring ups and down between the hill and river the path opened to a surprisingly wide riverbank. I suddenly felt refreshed and ready to undress myself on the Himalayan beach. Some of my team members who left ahead of me were waiting there, perhaps to share the same thrill they got upon seeing the place. We shared cold drinks and fruits and some of them took smoke break while we waited for the others. There was a bridge across to the other side and within a hundred meters another bridge brought us back on the same side of the river. 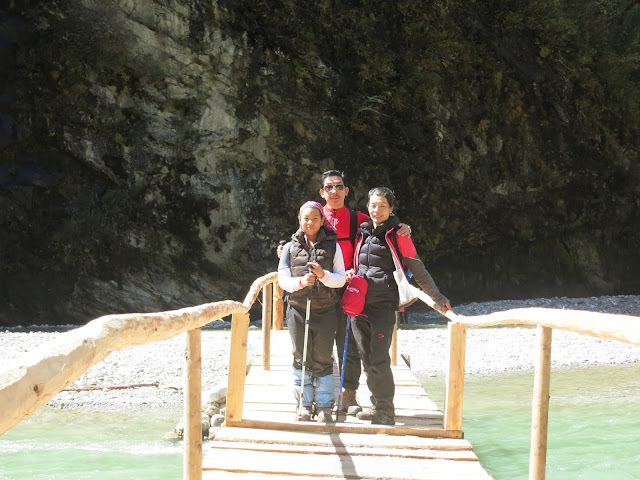 Dasho Sangay shared that these two bridges had saved us an extra one-hour trek over the steep mountain. He said this was a luxury Layaps could enjoy briefly during winters and this time it was only possible because of soldiers. Anyway, for horses and horsemen they still had to take that unforgiving detour because the bridge wasn’t suitable for horses. 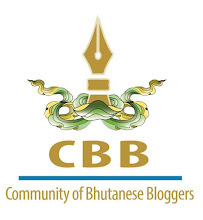 On my return journey I learned that Aue Nedup of Clean Bhutan, who left few days ahead of us, hadn’t known about the bridges and took the long way across the mountain along with his injured friends who had to be partially carried. O God. At 40 km point there was a makeshift canteen that served us lunch. We had to decide weather to fuel up here or continue another hour to Tashemakha. By now we stopped trusting locals when it came to distance and time, they would say an hour and we land up taking over four. Before our lunch was served NC Chairperson Sonam Kinga and team arrived. They had begun from Gasa this morning and walked all the way from Ponjothang yet they caught us. I felt disappointed with my speed. As if this wasn’t enough his team left us behind from there. Dasho Sangay excitedly joined his chairperson who said ‘the house moves together’. Our team from Ponjothang arrived with the horses. My friend Dorji was carrying a bag bigger than himself. He told me that the luggage filled with sleeping bags we had left in Koina couldn’t be adjusted on the horses therefore he had to be the extra horse. I felt bad but I was helpless. To his credit he made it to Laya without a complaint. The horseman looked familiar to me. I recalled he stopped by at Koina guesthouse last evening. When we requested him to pick up our load from Ponjothang he showed us a chit wherein he was directed to pick up Dzongkhag load. He had no clue about the content in the chit. In desperation I even conspired to change the content of the chit but didn’t actually do it. But now I was wondering who actually changed it? Or could it be that there was not load from Dzongkhag so our team got him? I forgot to ask. I never found out. Tashemakha was a military base pitched on a low plateau. The place was actually called Tashethang. From there we could see our destination high up on the mountain like a diamond in the sky. While the beauty of the mountain was so inviting the distance was mentally exhausting. The man in makeshift canteen told us that it was just an hour more from here. I knew it meant another four hours, and I was right at my speed it took so much. Gasa Dzongda must have foreseen that anyone could feel like I did at this point in journey so he had put up a banner here that read, “One day you won’t be able to do this, but today is not that day.” I read it loud and felt it deep. It worked like a dose of steroid in my nerves. We regrouped once for the last time only to be scattered gradually by our pace. Our horses and chef had left us too. Good for us because it meant our tents and food would be ready when we reach up. That last lap was the most agonizing with our muscles stiffening and the air thinning. I took rest in every ten steps or less. When I saw the historical gate to Laya I fell on my knees. I knew I made it. Just then my team member Ching Ching came running down towards me. She said there was someone on the road, probably drunk. It was Jigme our chef. There went our food! He said something strange happened to him and we blamed his countless bottles. He showed us his bottle, still full, and said he wasn’t drunk. He said the spirits affected him. We half-believed him. He had however delivered his bag with a local friend and even asked to serve us tea and help in preparing our meals. From the gate to the village was yet another struggle by then the darkness had set in. It was hard to envisage that a village so vast, stretching out across the hill could possibly exist. I couldn’t wait for the morning to see the sheer beauty of this place. But for now where was our camp? The third house called us in for tea. It was Jigme’s loyal friend. We declined knowing that we were so close to our camp. We headed for the huge campsite in the field only to find that it wasn’t ours. For sometime two of us were lost in Laya. We didn’t have an address to seek direction and no one knew about our team. As we lingered in the dark we heard someone calling out Ching Ching. There we found our campsite. Our tents were still on the ground and Penjor was struggling to set them up. He was the only person other than Aue Karma, who was yet to arrive, who knew how to do it. The horses soon brought down the kitchen tent that he had worked on first. The two of them who had arrived with Penjor were sent back to look for us and the remaining who were still coming. When they returned with the rest of team they thought we didn’t make it. We actually made a wrong entry to the village to be found by the search party. The kitchen team, even without the chief chef, was quick. After the dinner I went straight into my tent and wrapped myself in the sleeping bag. I didn’t have energy for mischief and even whisky didn’t taste good.